​Located in the heart of California’s agricultural belt, Tuff Boy began to create specialized trailers and accessories to serve the farmer, the trucker, and the food processor. The Tuff Boy product line now includes a wide variety of grain hoppers, tomato tanks, and other specialty bodies designed to improve efficiency in agricultural harvesting and transportation. Tuff Boy currently operates from two locations. The original Manteca plant specializes in manufacturing; the Lathrop office operates supports equipment sales, leasing, and maintenance. The companies are locally owned and managed. In the 1980s, second-generation family members Martin Harris and Bryce Perkins assumed key roles in the Tuff Boy companies; over the last ten years, Martin and Bryce have been preparing third-generation leaders to take over important responsibilities. Today, much of Tuff Boy’s business is managed by Joshua Harris, Jake Harris and Drew Perkins. The Tuff Boy companies have long been supported charities in the Manteca, Lathrop, and Ripon, especially programs that provide educational enrichment. Tuff Boy supports Give Every Child a Chance, Manteca Boys and Girls Club, local FFA programs, local 4-H programs, Boy Scouts of America, and various sports activities for youth. 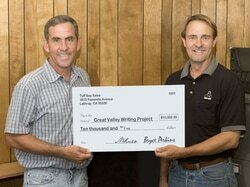 In 2005, the Tuff Boy founders heard about the work being done by Great Valley Writing Project, and they provided the funds that allowed GVWP to offer book study groups for local teachers and an intensive summer writing program for Manteca students. For over ten years, the Tuff Boy companies have continued their generous support. As GVWP's primary financial sponsor, Tuff Boy companies have contributed more than ten thousand dollars each year to support educational workshops for students and teachers in the Manteca-Ripon-Lathrop area. These programs would not exist without Tuff Boy support. We can’t thank them enough for helping us reshape the teaching of writing in our region.